I have to tell you something, and I don’t think you’re going to like it. Are you ready? Sitting down? Are you sure? Alright, deep breath and here goes: No one is expecting much from the Colorado Rockies this season. I know you’re shocked; floored even. But you need to know that this is for the best. Getting one’s hopes up for the Rockies is akin to taking a solid kick between the legs, then forcing a smile and asking for another. I’m not trying to pile on here. I’ve lived it. And for far longer than I care to admit. But here’s the thing: Whether they have expectations or not, and whether they are even equipped to handle any sort of expectations, is irrelevant. The fact is that the Rockies’ window needs to be open now. Before you laugh, consider that the definition of “window” in this case may be different than what you’re used to. Do I expect the Rockies to win the National League West for the first time in club history? I do not. Do I expect them to shock the world and blow through the postseason like they knew what they were doing all along a la the 2014 Kansas City Royals? Also negative. Do I think that this team is capable of playing meaningful baseball into July and August, in a season where that might actually gain them traction in the public’s consciousness beyond the party-like atmosphere at Coors Field? Now that’s a theory I can get behind. And get behind it we should, Rockies fans. If you’re still reading, understand that we’ve probably lost a good segment of the readership. Half were lost because of the notion that the Rockies can play meaningful baseball that long; the other half because the opportunity outlined above was not an actual laser light show at Coors Field advertising the superiority of the experience over every other sporting event in the history of mankind. But if you can persevere, I know we can get through this together. 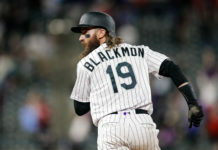 Consider: This will mark the Colorado Rockies’ first year of existence since their inaugural season in which neither the Colorado Avalanche nor the Denver Nuggets participated in their respective league’s postseasons. If we’re really being honest with ourselves, it also marks the first year of the Peyton Manning era with the Denver Broncos in which the public’s excitement over the team is somewhat subdued when it comes to the expectations for the season. Not to say that they couldn’t win it this year, but the outlook is somewhat more conservative in 2015 for the orange and blue. Now consider everything that’s already been written about the Rockies. This lineup is the class of the National League when healthy. Walt Weiss (although still awfully early) does appear to have a higher comfort level with in-game decisions (what held him back before we can all draw our own conclusions about). Jeff Bridich’s early interviews do indicate a departure in thinking from the previous regime. If we take all of this at face value (and believe me, I know that’s hard to do), what’s missing from the Rockies is the talent to turn it around overnight. Bridich inherited a bad situation, and while he’s already started with the roster’s makeover in bold moves like the demotions of Rex Brothers and Brandon Barnes, not to mention the release of Jhoulys Chacin, the fact is that this wasn’t a project that ever had a hope of being permanently solved during the course of one season. Colorado’s pitching staff remains projected as one of the worst in the majors. Justin Morneau should have been sold off to the highest bidder back when he was leading the league in batting as a 33-year-old first baseman who previously hadn’t been productive since 2010, rather than waiting for him to turn into a pumpkin and losing him for nothing (or worse: re-signing him). And who even knows what Bridich plans to do if Troy Tulowitzki can make it until August without a significant injury… Is there even a plan for if Tulo doesn’t get injured? The point is, before things really turn down the wrong road, even if the Rockies are doing the right things, not enough time has passed to reasonably have high hopes for the club in 2015. But, they can be relevant. They can compete in what promises to be a formidable division. And they can grab a bigger share of the Denver sports market by capitalizing on the rare phenomenon of an empty Pepsi Center in the late spring and a certain amount of resignation to also-ran status for a growing segment of Broncos Country. 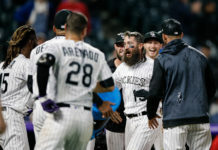 The Colorado Rockies have a golden opportunity to become relevant beyond their usual “sideshow” status in the hearts of Denver sports fans. How they go about approaching that opportunity will show us a lot about how serious the new regime is about bringing a competitive product to Coors Field. You may not be expecting much from the Rockies, but give the club a chance to surprise you. The signs are there that things can get better. And this is just the season to prove it.